Each Wednesday at 12:30 P.M.
Irene Cucurullo, Lion Gene Lee, and Irene's daughter, Marie Cucurullo. Irene and Marie volunteer for "Guiding Eyes for the Blind". They are currently training the two guide dogs pictured above. Five years after Lions Club was founded in 1917, the Durham Lions Club was founded in 1922. From the start this club launched service centered around activities for the visually handicapped, the blind, and youth; work in these areas continues to the present. The Durham Lions Club is led by talented, dedicated volunteer leaders from the local community. And, we are supported by Lions Clubs International Foundation (LCIF), which helps to fund Lions humanitarian projects. Look below to see the great things we are doing to help our community. If you would like to help us help others, then please make an online donation by clicking the button to the left. You are welcome to visit us at our weekly meeting if you would like to learn more. Financing the costs of 11 (Eleven) BLIND campers to a week at camp Dogwood each summer. Supplying discounted eyeglasses through LensCrafters for Durhamites in need of such assistance. Distributing 30+ (thirty plus) food baskets at Christmas time for the visually impaired and financially strapped in our community. Helping to fund the Triangle Radio Reading Service for the Blind which provides in depth information from magazines and newspapers (including grocery ads!) for those who can't read themselves. A Contribution, each year, to the Boys & Girls Home in North Carolina. Provide a building for Boy and Girl Scouts and Cubs and Brownie troops to meet as well as Financial support for their activities. Scholarships awarded annually to deserving DURHAM HIGH SCHOOL graduates (One thousand dollars per year for four years). 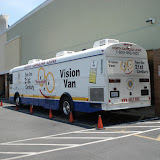 Assist Duke Eye Center in screening Durham Citizens for GLAUCOMA and other eye diseases at local Kroger stores using the NC Lions Foundation Mobile Screening Unit throughout the year. We plan six screening this year (the last in late fall). Contribute $100 per member to International, State and District 31G projects to aid the visually and hearing impaired(over $7,000 per year). support other fund raising project such as Habitat for Humanity and various projects to assist university teaching hospitals in Eye Research and treatment including ongoing contributions for equipment and buildings. ​We recycle used eyeglasses and hearing aids. Please bring your used eyeglasses and hearing aids to the donation box located in front of our Scout Center at 1850 Hillandale Rd. Income from Gumball machines located in various sites around the community. (If you would like a Lions sponsored Gumball Machine at your place of business - you will be helping in the betterment of the local community - Please contact the President of the Club). The Tenth Annual Lions Club Golf Tournament at Hillandale Golf Course was a huge success! There were 80+ players and we raised in excess of $6,000 for our 501(c)3 tax deductible organization and to the benefit of those we help. We sell brooms manufactured by the BLIND. Facility Rental Proceeds – We allow individuals and originations to rent the Durham Lions Club Scout Center for their special events. Proceeds from the special event rentals allow us to provide a facility for a Boy Scout Troop, Cub Scout Pack, Boy Scout Crew, and two Girl Scout Troops free of charge! Please consider hosting your next event at the Scout Center, which will directly benefit the youth in our community. We have over 70 able and willing members who support all of our activities. We could do more for the community if you join us - contact the President if you would like to be a Lion! !